Data Sources Ohio Elects the President, p. 87. The Progressive Party won a respectable number of offices in the 1912 elections for a third party, including nine seats in the U.S. House. Most of their support returned to the Republican Party in the local elections of 1913, and in 1914 the party lost half of its elected officials. Early in 1916, the big question for the Progressive Party was whether Theodore Roosevelt would be a candidate. Supporters began to enter his name into the Progressive primaries in various states. TR announced on 1/4/1916 that he would not be a candidate for President and asked for his name to be removed from primary ballots. He also said that he planned to be in Chicago during the week when the national conventions of the Progressive Party and the Republican Party were planned [NYT 1/5/1916]. The national committee of the Progressive Party met on 1/10/16 to make the arrangements for the national convention. Those gathered were generally in favor of a second TR campaign, saying that even though he had withdrawn, he was the candidate the most likely to defeat Wilson. The party reserved 800 hotel rooms and several venues for convention committees to meet [NYT 1/11/1916]. Some delegates mentioned the possibility of Hughes as a compromise candidate, while others supported Judge Elbert H. Gary NY [NYT 1/12/1916]. As the states were preparing to select national convention delegates, TR changed course. While on a cruise to the West Indies, he issued a statement that though he would not campaign for the nomination, he would accept it at this "rare time in history" in an effort to defeat President Wilson [NYT 3/10/1916]. As delegates began to arrive for the two Chicago conventions, delegates began to cross-pollinate. Republican leaders recognized that they needed Progressive support in order to regain control of the U.S. Senate in the 1916 elections. The leading GOP contender, Charles E. Hughes, was the most suitable candidate for attracting Progressive support. Progressive delegates continued to urge the nomination of TR by both parties and insisted that they still sought to run slates of candidates for other offices [NYT 6/3-4/1916]. Leaders of the two parties held secret talks on the day before the conventions opened, but could not reach an agreement [NYT 6/6/1916]. The second Progressive Party National Convention was held in the Auditorium Theatre in Chicago IL on 6/7-10/1916. The setting consisted of a recessed area called the "pit" where the delegates sat. A stage in front was decorated heavily with flags. Surrounding the delegates were three layers of balconies, but the highest layer was empty on opening day due to a heavy rain. Raymond Robins of Illinois was chosen as the temporary chairman and keynote speaker. Robins told the delegates that TR was "the foremost private citizen of the world." When he first mentioned TR's name, the delegates began a demonstration that lasted for 93 minutes - the longest in convention history (four minutes longer than the Bryan demonstration of 1908). Party leaders determined beforehand how long the demonstration would last, and at intervals when it appeared that the delegates were ready to resume the business, leaders directed the band to play or sent emissaries to rouse the delegates to further celebration. Victor Murdock of Kansas had established a telephone connection with TR just before the convention began, and he listened to the demonstration. When Robins resumed his speech, delegates sat in silence as he told them that the party might have to forego TR's nomination if the conferees with the GOP found a suitable compromise candidate. The second day of the convention nearly caused a division. When the convention convened at 2:30 p.m., the delegates began with an unofficial demonstration, calling out "Teddy! Teddy!" On the stage were Hiram Johnson, Gifford Pinchot, George W. Perkins, chairman Robins, and John M. Parker. Parker was ready to nominate TR on the spot. The credentials committee and the committee on permanent organization reported. Robins was chosen as the permanent chairman. The major piece of business was a proposed peace conference with the Republicans, offered by James R. Garfield of Ohio. Moderate and radical Progressives differed markedly on the proposal. TR sent a telegram to the delegates asking them to support the idea. The moderates finally won out when news reached the convention that the Republicans were willing to talk. The following committee was appointed: George W. Perkins, Hiram Johnson, Horace S. Wilkinson, and Charles J. Bonaparte. The platform was read, but action was held off to allow the conference committee to consider a joint platform. The convention held a two-hour session in the evening that was devoted to speeches [NYT 6/9/1916]. The third day of the convention was one of waiting for a response from the conference committee. Moderates were encouraged that the Republicans had taken two ballots and were not near a nomination. Radical Progressives still didn't understand why they were waiting to nominate TR. Delegates in the middle began to wonder if the Republicans were trying to stall for time and then reject the conference committee, and they made it clear that the Progressives would take a ballot the next day. Sen. William E. Borah strolled over to the Progressive convention and was allowed to deliver a message lauding TR's record. The delegates had lost their patience when the evening session began at 8:30 with still no word from the conference committee [NYT 6/10/1916]. On the fourth and final day of the convention, the delegates revolted against the delay tactics of the convention organizers. When Perkins moved for another delay in balloting, John M. Parker was recognized. He said "this is probably the greatest crisis in the history of the United States... We came here to select Theodore Roosevelt and to make one of the greatest fights ever made in the United States..." He received some of the loudest cheers at the convention. When a Pennsylvania delegate moved that the proposed platform be adopted, all delegates but one voted in favor. The delegates were ready for presidential nominations. After one delegate was ruled out of order for recommending a nomination without speeches or a ballot, James R. Garfield convinced the reluctant delegates to wait for the Republican convention to begin its ballot. 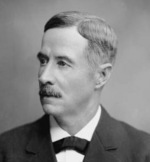 When word was received that the Republicans had begun, Bainbridge Colby placed TR in nomination with a short speech. Perkins tried to enter Henry C. Lodge into nomination, but neither the chairman nor the delegates were interested. Hiram Johnson seconded TR's nomination and asked that it be made unanimously, to be followed by a recess to see if he would accept. The delegates almost to a man supported the motion, and a long demonstration followed, followed by adjournment at 12:47. In the meantime, the Republican convention had nominated Hughes. When the convention reassembled at 3:00 p.m., the first item of business was the nomination of a candidate for vice president. Louisiana offered John M. Parker, who had pushed throughout the convention for TR's immediate nomination. Candidates who were placed in nomination but declined include Hiram Johnson and Raymond Robins. Parker was nominated by acclamation and gave a short acceptance speech. Victor Murdock spoke later and pointed out that William J. Bryan was seated in the reporters' section. Just as the convention was ready to close, TR's private secretary John W. McGrath delivered a telegram in which TR stated that he did not wish to run and recommended that the national committee consider the candidate chosen by the Republicans (Hughes). Disheartened delegates left the hall at 5:00 p.m.; many of them sent telegrams to Sagamore Hill to request that TR reconsider. [NYT 6/11/1916]. Although Hiram Johnson went to Sagamore Hill to try to convince TR to be a candidate, he steadfastly refused. The Progressive Party immediately began to come apart. The New York party issued a statement calling for the national committee to make a substitute nomination [NYT 6/16/1916]. The Maine Progressive Party disbanded on 6/17 [NYT 6/18/1916], and four days later the Kansas Party withdrew all its candidates from the ballot [NYT 6/22/1916]. In Pennsylvania, the Progressive Party operated under the name of the Washington Party. Its state committee met on 7/11/1916. nominated Hughes for President by a vote of 22-11, then voted 23-10 to end its organization. Its candidates, already chosen for 1916, remained on the ballot [NYT 7/12/1916]. John M. Parker, the VP nominee, continued to work for the Party. He called a meeting of Progressive leaders that met in Indianapolis on 8/3/1916. The gathering re-organized the party but did not name a presidential nominee. Parker remained the VP nominee, and states with active affiliates were encouraged to put slates of Electors in the field. [NYT 8/5/1916]. Parker campaigned in several states, working to assist the remaining Progressive state affiliates [NYT 10/8/1916]. In a ceremony arranged in New York City for him to accept the nomination, Parker announced that during his speeches, he would encourage voters to support President Wilson [NYT 10/15/1916]. Parker's return to the Democratic Party set the stage for a minimal showing for Progressive Party candidates in the election.